In the present study 55 IgVH genes amplified from three different anatomical regions of a rheumatoid arthritis (RA) patient were analyzed, adding further information on synovial B-cell maturation and recirculation in RA. This analysis demonstrated somatically mutated IgVh genes in all regions studied, with amino acid deletions and mixed IgVh molecules, suggesting the existence of a novel pathway to generate (auto) antibody specificities. Comparison of amino acid sequences of amplified genes that belong to the VH1 family (with predominantly the same germline counterpart) exhibited strong homology, indicating an apparently conserved mutational pattern. This suggests that the number of antigens that activate B cells in different locations is restricted. The most striking result was the finding of clonally related sequences in different anatomical regions, indicating a recirculation of activated B cells between the different affected joints. Although IgV genes in rheumatoid B cells have been intensivelyanalyzed, many questions concerning antigen driven B-cell maturation andrecirculation remain unanswered. It would be interesting to know whether B-cellmaturation in rheumatoid tissue is different from that in secondary lymphaticorgans. Moreover, it would be interesting to know whether there exists arestricted number of antigens that act on the lesions of different anatomicalsites of the RA patient, and whether B cells recirculate between the differentjoints. RNA and genomic DNA were prepared from tissue sections from threedifferent anatomical sites, with different histopathologies and differentonsets (left and right peroneal tendons and cubita synovial membrane), of a RApatient. Genomic DNA was amplified by seminested polymerase chain reaction(PCR), and the cDNA corresponding to the RNA was amplified by PCR using primersspecific for each IgVH family. The obtained sequences were compared with theirgermline counterparts on the V-Base data Bank . Animmunohisto-chemical analysis of the infiltrate and the clinical data of localdisease activity were also included. In the locations with longer disease duration (right peronealtendon 5 months, left peroneal tendon 2 months) a very intense inflammatoryinfiltrate with germinal centers containing Ki-M4-positive follicular dendriticcells (FDC) was observed. In the location with shorter disease duration (rightcubita 2 weeks) a low, diffuse and nonfollicular infiltration with markedoedema was detected. From the 55 analyzed clones seven expressed nonfunctionalrearrangements (pseudogenes) with stop codons, and 48 were found to expressfunctional genes. Among the 48 clones that expressed functional genes, therewere two that had amino acid deletions on their complementarity determiningregion (CDR)2 - clones K194/1 and K194/111 - similar to theones described by Wilson et al  and Goossenset al . Two types of mixed molecules werefound. Mixed molecules of the first type (k194/57, k194/67 and k194/109) are composed of rearrangements of two different IgVgenes. Mixed molecules of the second type (k194/126,k194/119, k194/30 and k194/99) are composed of a IgVgene rearrangement that is fragmented by insertions of small random sequences.These insertions are different from the ones described by Wilson et al since they are not duplicates or parts of IgV genes.The ratio of replacement mutations to silent mutations (R/S ratio) increasedwith disease duration. 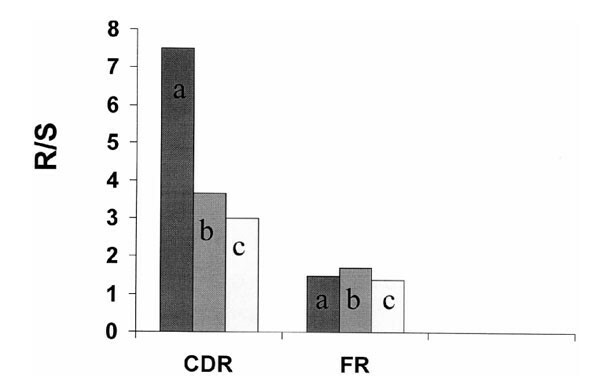 There was strong heterogeneity among the CDR3segments. The amino acid sequences that belonged to the VH1-family obtainedfrom the three anatomical regions were primarily compared with the amino acidsequences of their closest germline counterparts (Fig. 1a). One result from this comparison was the heterogeneity inthe CDR3 rearrangements. Moreover, sequences k194/58 andk194/82 are clonally related (confirmed at nucleotide level). Then,the 21 amino acid sequences were compared with the most widely used germlinecounterpart IgHV1-18 * 01 (Fig. 1b).All of these VH1 sequences had mainly conservative mutations in the frameworkregion (FR) and nonconservative mutations in the CDR. Also, there was an almostoverall conservation of the mutational cold spots and 'structural coldspots'  among the 19 VH1 segments. Thereplacement (11 from 19 replacements resulted in a proline residue) in position34 of CDR2 could be interpreted as an antigen-selected mutational hotspot. The comparison of the five sequences belonging toIgHV4-30-1/4-31 * 02 resulted in two types of clonal relation(Fig. 2a). The first type of clonal relation, betweensequences k194/100 and k194/101 (Fig. 2b), suggests that both sequences are derived from a singleprogenitor cell. 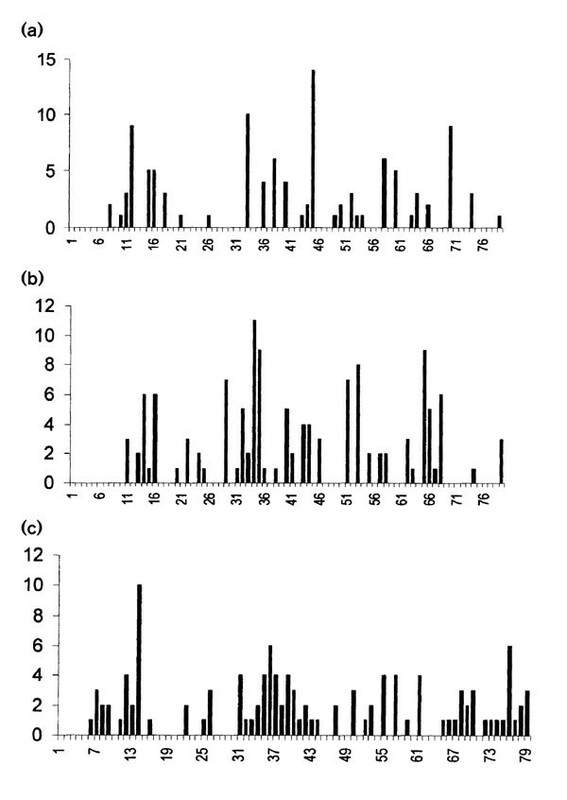 The second type of clonal relation is between sequencesk194/23, k194/102 and k194/103 (Fig. 2c). It suggests that an unmutated progenitor cell gave rise tok194/23 (left peroneal tendon), from which k194/103 (rightcubita) derived and later generated k194/102 (right cubita). The analysis of the 55IgVH sequences corroborates the findings ofother groups that studied a singlelocation and RA B-cell hybridomas [5,6,7,8,9,10] and addsfurther information on B-cell distribution and activation in RA. First, aminoacid deletions and mixed molecules could be interpreted as novel pathways togenerate antibody specificities, leading, for instance, to autoreactiveantibodies that could contribute to the local and systemic tissue destruction.Second, an apparently conserved mutational pattern among the 19 amino acid VH1segments suggests that in all three RA lesions of this patient the synovial Bcells are dealing with a restricted number of antigens. Third, the existence ofclonally related B cells in the cubita and left peroneal tendon leaves no doubtthat in this patient there is a cyclic re-entry of mutated B cells in thehypermutation process . The already mutated B cellsfrom the early RA lesions sequentially colonize new germinal centers insecondary lymphatic organs as proposed by Kepler et al . These reactivated B-cells then invade new anatomicalregions, leading to the perpetuation of the chronic inflammation in RA. Comparison of the translated amino acid sequences of 19 VH1segments with their closest germline counterparts. (b) Comparison of thetranslated amino acid sequences of 19 VH1 segments with germline geneIGHV1-18 * 01. All sequences are deposited in Genbankdatabase with the following accession numbers: AF209875-209902;AF211924-211932; AF241154-241156 and AF241186-241199. Analyses of the VH4 family amplificates. (a) Comparison ofthe five nucleotide VH4 sequences with their germline counterpartIgHV4-30-1/4-31*02. (b) Clonal relation between sequencesk194/100 and k194/101; replacement (r) and silent (s)mutations on the VH segment when compared with the germline. (c) Clonalrelation between sequence k194/23 amplified from the left peronealtendon (lpt) and sequences k194/102 and k194/103 amplifiedfrom the cubita. Dashed arrows indicate the possibility of cyclic re-entry ofthe mature B cells into the hypermutation process. Histopathology (haematoxylin and eosin) and immunohistochemistry(double staining: indirect immunoperoxidase and alcaline phosphatase in insertof parts a and b) of rheumatoid synovial tissue from three different anatomicallocations of the RA patient. These are as follows: (a) right peronealtendon sheath; (b) left peroneal tendon sheath with inserted figureshowing Ki-M4 positive FDC network (brown) surrounded by CD20+ Blymphocytes (blue), representing a germinal center; and (c) synovialmembrane from the right cubita. Arrows indicate enlarged synovial intima(original magnification 350×). Total R/S ratios in the FR 1+2+3 and CDR 1+2 of B-cell clones fromeach different anatomical region of the RA patient: (a) right peronealtendon sheath; (b) left peroneal tendon sheath; (c) cubita. Amino acid replacement plot, calculated across translated aminoacid sequences shown in Figure 3b. (a) Conservative replacement (Y D, E;↔ N D, E; L↔ V, A, F, I; S↔ N, T, Q; D↔ E;K↔ R); (b) indeterminant replacement (H↔ all amino acids; M↔ allamino acids; G↔ A, V, L, I, F, P; W↔ R, K, S, T, N, Q, D, E; P↔ A, V, I,L,F; K, R↔ N, Q, S, T, Y; C↔ D, E, K, N, Q, R, S, T, Y; Y↔ K, R, N, Q, S,T); and (c) nonconservative replacement (R, K↔ E, D; D, Y, E↔ A, I,L,P, F; S, T, Q, N↔ A, I, L, V, P, F; R, K↔ A, I, L, P,V, F; C↔ A, I, P, V, L,F; W↔ A, I, P, F, V, L; G↔ C, D, E, R, K, N, Q, S, T, Y). The type ofreplacement was defined on the basis of [45,46,47,48]. Generation of mixed molecules according to Maizels . In RA synovial tissue mixed molecules could be the resultof a templated or an untemplated hypermutation DNA repair process. Molecular analysis of synovial tissue and B-cell hybrido-mas [5,6,7,13] has demonstrated that synovial B cells, which are a characteristic feature of RA [7,14,15], are expanded in an antigen-dependent manner . Because germinal centers may be detected primarily in synovial tissue of severely affected joints of RA patients [15,17], this is very suggestive that antigens that drive local B-cell expansion are directly involved in the pathogenesis of RA. Although IgV genes in rheumatoid B cells have been intensively analyzed, many questions concerning the antigen driven B-cell maturation and recirculation remain unanswered. It would be interesting to know whether B-cell maturation in rheumatoid tissue is different from that in secondary lymphatic organs. Moreover, it would be interesting to know whether there exists a restricted number of antigens that act on the lesions of different anatomical sites of the RA patient, and whether B cells recirculate between the different joints. Therefore, in the present study IgVH genes from synovial tissue B cells of different anatomical regions (with different times of disease onset) from a RA patient were analyzed. Furthermore, we included a histopathological analysis and clinical data of local disease activity, which can give a more complete picture of the role of B cells in the pathogenesis of RA. Tissue samples (one from the right and another from the left tendon of musculus peroneus longus and one from the cubita synovial tissue) from a 48-year-old female patient with confirmed seropositive RA  were obtained at synovectomy and were snap frozen. The patient was receiving antirheumatic medication (gold, methotrexate and sulphasalazine). In the present investigation, the degree of local disease activity was scored according to the method of Fuchs et al  and Krenn et al , on the basis of warmth, effusion and swelling. The patient was seropositive for rheumatoid factors. All tissues (approximately 50%) were fixed in formalin and embedded in paraffin (Giemsa, haematoxylin and eosin staining) to be used for diagnosis and scoring of the degree of inflammation. The only material used for immunohistochemical analyses was tissue that exhibited macroscopic signs of inflammation, taken from at least three different regions of the resected synovial membrane. For immunohistochemical staining, 7-μ m cryosections (mounted on poly-L-lysine-coated slides) were used. Immediately before staining, the cryosections were treated with acetone for 10min, air dried at room temperature (10-20min) and double immunohistochemical staining was performed, as described by Krenn et al . Briefly, the indirect immunoperoxidase technique (Ki-M4; DAKO, Hamburg, Germany) was combined with the alkaline phosphatase/antialkaline phosphatase technique (CD20; DAKO). No counterstaining was performed. In all cases, control staining was performed and single stainings were compared with double stainings in order to ensure that the pattern of immunohistochemical reaction remained unaltered. 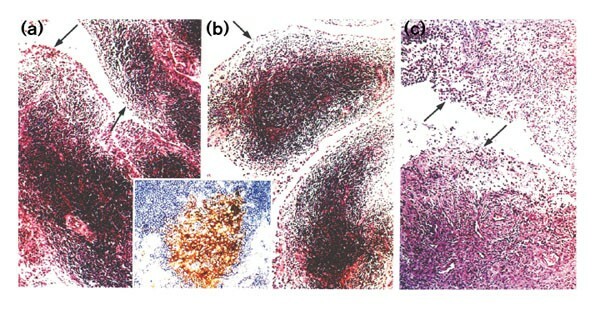 A portion of tissue (approximately 50%) was fixed in formalin and paraffin-embedded (Giemsa, haematoxylin and eosin staining) for use in diagnosis and scoring of the degree of the inflammatory infiltration, which in the present study was performed according to the method of Krenn et al  on a semiquantitative 1-5 scale. Very low inflammatory infiltration was indicated by 1 on the scale: the synovial intima is slightly enlarged (two to three cell layers thick); the degree of lymphocytic infiltration is very low, showing a diffuse pattern; and the subsynovial region exhibits chronic tissue granulation with slight fibrosis. Low inflammatory infiltration was indicated by 2 on the scale: the synovial intima is slightly enlarged (two to three cell layers thick), and the degree of inflammatory infiltration is low, with a diffuse perivascular lymphocytic and plasma cell infiltration; and the subsynovial region shows chronic tissue granulation with moderate fibrosis. Moderate inflammatory infiltration was indicated by 3 on the scale: the synovial intima is moderately enlarged (three to five cell layers thick), and the degree of lymphocytic infiltration is moderate, with small follicle-like aggregates near small blood vessels; and there is moderate cellularity of the subsynovial region, which exhibits slight fibrosis. Strong inflammatory infiltration was indicated by 4 on the scale: the synovial intima is extensively enlarged (five to 10 cell layers), and lymphocytes exhibit a dense follicle-like pattern; and the 'interfollicular' area exhibits very high cellularity without fibrosis. Very strong inflammatory infiltration was indicated by 5 on the scale: the synovial intima is extensively enlarged, and the distribution of lymphocytes exhibits a dense follicle-like pattern with formation of germinal centers; and granulomas and hemigranulomas can be seen in the subsynovial region. In each histopathological analysis, 10 fields were examined, and the most prominent finding in a given field determined the score. The final concentrations of the reagents were 0.1mmol/l MgCl2, 200 μ mol/l of each dNTP, 10pmol/l of each primer and 2U Taq DNA polymerase. The cycle program consisted of a denaturation step at 95°C for 5min followed by five cycles at 95°C for 40s, 65°C for 40s and 72°C for 1min and 50s; five cycles at 95°C for 40s, 60°C for 40s and 72°C for 1min and 50s; and 25 cycles at 95°C for 40s, 55°C for 40s and 72°C for 1min and 50s. The cycles were followed by a final 10-min incubation at 72°C. Aliquots of the final PCR products were separated by electrophoresis using a 2% low melting agarose gel (Roth, Karlsruhe, Germany), and DNA bands in the range of 350bp were purified from the agarose gel using High-Pure DNA gel extraction kit (Boehringer Mannheim). Cloning of PCR fragments was performed using the pCR-Script Amp SK(+) cloning kit (Stratagene, Heidelberg, Germany). Positive clones were sequenced using the DyeDeoxy Termination Cycle Sequencing Kit (Applied BioSystems Inc, Weiterstadt, Germany), and analyzed using an automated DNA sequencer ABIPrism373 (Applied BioSystems Inc). Both strands were sequenced using T3 and T7 primers. The sequences were analyzed using DNAman for Windows software (Lynon BioSoft, Vaudreuil, Quebec, Canada), Genebank and v-Base databases . The female patient, who suffered from a confirmed seropositive RA with involvement of tendon sheaths, exhibited severe signs of local disease activity, with tenosynovitis of the right distal peroneus longus tendon and left distal peroneus longus tendon, and synovialis of the right cubita (Table 1). The durations of local disease were 5 months, 2 months and 2 weeks, respectively. A heterogeneous inflammatory infiltrate could be observed in the different locations. In both locations with longer disease duration (right peroneal tendon [5 months] and left peroneal tendon [2 months]) a very intense inflammatory infiltrate, with Ki-M4-positive FDC-containing germinal centers (Fig. 3a,3b and insert), could be observed (inflammatory score 5). However, in the right cubita (disease duration 2 weeks) a low, diffuse and nonfollicular infiltration with marked oedema (inflammatory score 2) was detected (Fig. 3c). The latter synovialitis histopathologically showed a more acute inflammatory reaction, whereas in the right and left peroneal tendons the morphological pattern of a typical chronic tendosynovitis was present. Immunohistochemically, the right and left peroneal tendons exhibited a dense follicular-like infiltration, with Ki-M4-positive FDC and peripherally located CD20-positive B lympocytes representing germinal centers (insert in Fig. 3a and 3b). In the right cubita only a very low and diffuse nonfollicular distribution of lymphocytes without Ki-M4-positive FDC could be recognized. 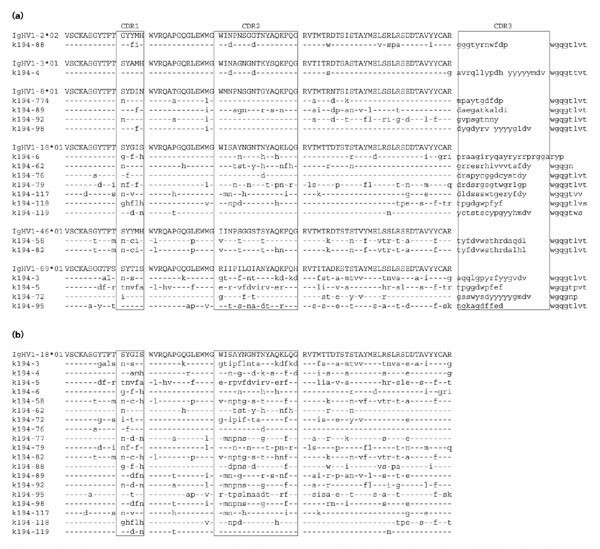 From the 55 analyzed clones (Table 2), sevenexpressed nonfunctional rearrangements (pseudogenes) with stop codons, and 48were found to express functional genes. The existence of pseudogenes has beenlargely described in IgV genes amplified from genomic DNA of healthy [1,23] and diseased [4,24] individuals. Furthermore, the presence of pseudogenes indiseased individuals is largely related to specific mutations on the RYGWmotifs . Based on these findings, it is not surprisingthat we found pseudogenes in the genomic DNA amplificates (k194/81,k194/120 and k194/126). However, we also identifiedpseudogenes in the cDNA amplificates (k194/30, k194/33,k194/130 and k194/135), which have not yet been described inthe literature. These pseudogenes could be the product of a PCR artifact (maybedue to an elevated number of cycles) that introduced STOP-codons in theIgV-gene sequence. However, because the sequences were read in both directions(5' -3' and 3' -5'), and both readings yielded the sameconfirmatory results, we do not consider the pseudogenes in the cDNAamplificates to be PCR artifacts. The existence of such pseudogenes could beexplained by the findings of Drapkin et al that DNA repair enzymes are part of the RNA polymerase II transcriptioninitiation process. Hence there could be a defective DNA repair mechanism that,in the case presented here, could lead to the introduction of STOP codons inthe RNA molecule. Among the 48 clones that express functional genes, there were twopresenting amino acid deletions on their CDR2: clones K194/1 andK194/111. These detected deletion events should be regarded as theresult of somatic hypermutation and not as a PCR artifact, because they werefound in the intrinsic somatic hypermutation hotspots [26,27,28,29], and also involved triplets from CDR2, which leaves thetranscripts functionally in frame without profoundly altering the backbonestructure of the molecule, as defined by Wilson et al . Two types of mixed molecules were found. Mixed molecules of thefirst type (k194/57, k194/67 and k194/109) arecomposed of rearrangements of two different IgV genes. These two mixedmolecules could be considered PCR artifacts, like the ones described by Bridgeset al  for amplified Vκ gene segmentsin RA synovium. This could be due to the fact that RNA is very unstable andcould have fragmented while the samples had not been snap frozen (for reasonsof hygiene it is not allowed to take snap-freezing apparatus into the operatingtheatre). However, two facts counter the PCR artifact hypothesis. First, the Bcells of the RA synovial samples are used in our laboratory not only for IgVanalysis, but also for hybridoma production, so their RNA must be intact toallow successful cell fusion [5,6].Second, the sequences were read in both directions (5' -3' and3' -5'), and both readings yielded the same confirmatory results offunctional mixed molecules. Mixed molecules of the second type (k194/126,k194/119, k194/30 and k194/99) are composed of a IgVgene rearrangement fragmented by insertions of small random sequences. Theseinsertions are different from the ones described by Wilson et al since they are not duplicates or parts of IgV genes.On one hand, this could happen because of the insertion of incorrectlyamplified fragments, thus resulting in a PCR hybrid artifact. On the otherhand, however, the sequences were read in both directions (5' -3'and 3' -5'), and both readings yielded the same confirmatoryresults. Also the use of nested PCR to amplify the genomic DNA strongly reducesthe possibility of amplification and insertion of incorrect fragments [24,31], thus rendering improbable thehypothesis of PCR artifact. Although not considering the deletions and the mixed molecules asPCR artifacts, we made the decision not to consider them for further mutationalanalyses, because a rational comparison with these sequences is notpossible. The 41 in-frame functional clones accumulated between 4 and 46replacements on their amino acid sequence. The R/S ratios in the CDR of allclones from each anatomical region were all higher than 3. There was a directcorrelation between the R/S values and the time of local disease duration.Locations with longer disease activity (right and left peroneus longus tendons)also had higher R/S values in the CDR than the location with a later onset(right cubita; Fig. 4). Even though a relatively reduced number of different VH germlinegene segments was used, the CDR3s were encoded by D-gene segments that differedin both amino acid sequence and length, and all of the six known human JH genesegments were found. As expected for the normal adult Ig repertoire , the JH4 and JH6 segments were the most commonly used. The comparison was restricted to the VH1 and VH4 families, because they yielded the more relevant results. The mutational patterns of immunoglobulin VH1 genes was studied byBorretzen et al  in peripheral bloodmonoclonal IgM rheumatoid factors of healthy individuals and RA patients.However, this kind of mutational pattern comparison has not been extended to Bcells from RA synovial tissue. As is widely known, the primary structure of anantibody, formed by the amino acid sequence, determines all of its chemical andbiological properties. Thus, the amino acid sequences that belong to the VH1family obtained from the three anatomical regions were compared with the aminoacid sequences of their closest germline counterparts (Fig. 1a). One result from this comparison is the heterogenity in theCDR3 rearrangements. Moreover, sequences k194/58 and k194/82 are clonallyrelated (confirmed at nucleotide level, data not shown). Then, the 21 amino acid sequences were compared with the mostwidely used germline counterpart IgHV1-18 * 01 to determinewhether a common motif could be discerned (Fig. 1b). Aspostulated, the conservation of the amino acid sequence of all three FRs iscrucial for the interaction with the antigen . Infact, for FR 1+2 we observed highly conserved regions (Fig. 5). The residues at positions number 6, 10 and 11 from FR1 and thecomplete FR2 (except positions 22 and 26) showed a high conservation of theamino acid residues. In FR3, we found high sequence diversity (Figs1b and 5), even though there wasstill conservation within residues 48-49, 51-52, 54, 56, 58-60, 62-64, 66-67,69 and 71-75. All the other positions had a total of 30 nonconservativesubstitutions, and therefore they probably do not play a determining role inthe antigen-mediated activation process. As expected, the number ofnonconservative substitutions in both CDR1 and CDR2 was highly elevated.Nevertheless, the 3' end of CDR2, covering residues 41-47, contained atotal of 25 substitutions, but only five were nonconservative (Fig.5). More striking evidence was that residues in position34 of CDR2 in 11 out of 19 replacements resulted in a proline residue. It couldeven be speculated that position 34 of CDR2 may be an antigen-selectedmutational hotspot, because it does not belong to the defined somatichypermutation hotspots [28,29].In position 45 there are 13 substitutions from Leu to Phe, but 12 of themcannot be considered real substitutions because, as shown in Figure1a, the germline IgHV1-18 * 01 is theonly one to have a Leu in that position instead of the more frequent Phe.Therefore, in this position we only considered Leu-Ile and one Leu-Phe (fork194/62) as real substitutions. As stated by Chang and Casali , theCDR1 is the IgVH gene region with higher susceptibility to amino acidreplacement, and this was in fact the case for all the obtained sequences. TheCDR1 had the highest number of nonconservative replacement mutations, whichmakes it very unlikely to be primarily involved in the antigen-mediatedactivation. From the seven amplified sequences of the VH4 family (four fromthe cubita and three from the left peroneal tendon) five hadIgHV4-30-1/4-31 * 02 as their closest germline counterpart,and the other two had IgHV4-59 * 01 andIgHV4-30-4 * 06 (Table 2). Whencomparing the five sequences that belong toIgHV4-30-1/4-31 * 02 (Fig. 2a) witheach other, there was evidence of two different clonal relations. The firstclonal relation was between sequences k194/100 and k194/101(Fig. 2b), suggesting that both sequences are derivedfrom a single progenitor cell with the rearrangementIgHV4-30-1/4-31 * 02-IgHD4-17 * 01-IgHJ5 * 02.The second clonal relation was between sequences k194/23,k194/102 and k194/103 (Fig. 2c),suggesting that sequence k194/102 was derived from k194/103,which in turn was derived from sequence k194/23 that had a progenitorcell with the rearrangementIgHV4-30-1/4-31 * 02-IgHD2-2 * 02inv-IgHJ4 * 01.Furthermore, the small number of mutations of all of these five sequences whencompared with the germline could be taken as indirect evidence that thegermline already encodes a high-affinity antibody, as suggested by Williams andTaylor . #, Clone presenting amino acid deletions; ##, mixed molecule; P,pseudogene; ND, not determined; Bold indicates amplification Fromgenomic DNA. Various studies have demonstrated that somatically mutated B-cells are present in RA synovial tissue [5,6,8,9,10] and in human RA hybridomas [7,36]. However, we studied the IgV genes of synovial B cells taken from different anatomical regions, with distinct histopathology and local disease duration, of the same RA patient. The analysis of the 55IgVH sequences corroborates the findings of other groups that studied a single location, and adds further information on B-cell distribution and activation in RA. Amino acid deletions and mixed molecules: novel pathways togenerate antibody specificities? 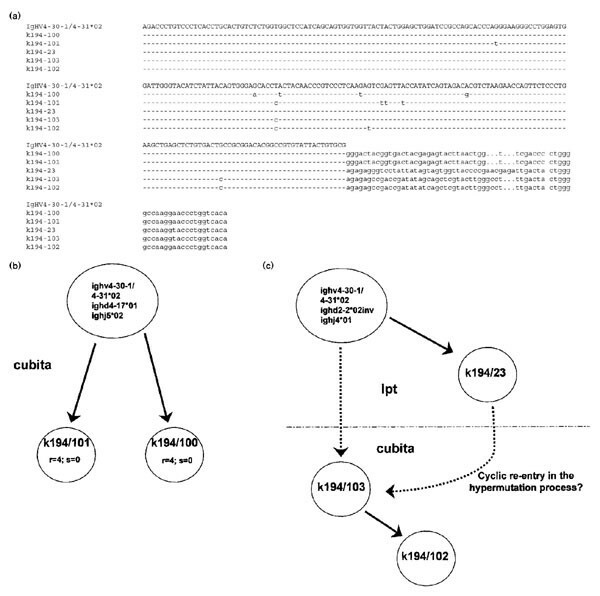 Recently, the introduction of deletions and duplications, in addition to nucleotide exchanges, has been described as a feature of the somatic hypermutation process [2,3]. Amino acid deletions in the IgV genes have only been described in lymphomas and healthy secondary lymphatic tissue, however [2,3]. In the present study we report the existence of such amino acid deletions in the IgV genes from synovial B cells of an autoimmune disease. For the first time, amino acid deletions in the VH genes were found in B cells of an autoimmune disease. The detection of these deletion events in RA synovialitis stresses the functional homology of the synovial membrane to secondary lymphatic tissue. Also for the first time, IgV gene mixed molecules were found that are formed either by two segments of different IgV genes or by a IgV gene rearrangement that is fragmented by random insertions. The mechanisms that underlie the formation of these mixed molecules could be modified pathways to the unified model for somatic hypermutation, as proposed by Maizels  (Fig. 6); an initiating lesion could lead to a hypermutation either templated (using another germline gene as template) or untemplated (by inserting small random sequences). In some cases the process of untemplated hypermutation could lead to the insertion of STOP codons, rendering the gene nonfunctional. Hence, the production of mixed molecules and the introduction of deletions could represent novel pathways for RA synovial B cells to generate new specificities that lead, for instance, to autoreactive antibodies that could contribute to the local and systemic tissue destruction. The comparison of the amino acid sequences of the 19 VH1 segments from the different locations provided some valuable data on the interaction of the RA synovial B cells and their target antigen(s). All of the VH1 sequences had mainly conservative mutations in the FR and nonconservative in the CDR, thus, agreeing with the results from Wedemayer et al . When resolving at 2.1Å, the crystal structure of a germline antibody Fab fragment and its complex with hapten, they observed an expansion of the binding potential of the primary antibody repertoire. This expansion derived from configurational stability due to antigen binding and somatic mutations, nonconservative mutations in the CDR that raised the affinity for the hapten, and conservative mutations in the FR. Another important finding was the almost overall conservation of the mutational cold spots and 'structural cold spots'  among the 19VH1 segments. The interesting absence of mutations in positions 17, 23, 28, 30, 48, 56 and 71 suggests the existence of more 'structural cold spots' in the VH1 family than those described. During the germinal center reaction (for instance in the follicles of the two earlier lesions of this patient), rearranged B cells with low-affinity receptors improve their affinity by somatic hypermutation [39,40]. Nevertheless, these mutations can also decrease the affinity instead of expanding it. Therefore, as reported by Meffre et al , under appropriate regulation VDJ rearrangements take place in mature B cells of human tonsil. Hence, the heterogenity observed on the CDR3 of the 19 VH1 sequences could be due to a reactivation of the rearrangement process in order to rescue these RA synovial B cells from deleterious somatic mutations, or to further increase their binding affinity. Based on the above findings, there appears to be a conserved mutational pattern among all 19 VH1 segments, hence suggesting that in all three RA lesions of this patient the synovial B cells were activated by a restricted number of antigens. This is strengthened by the replacement in position 34 of CDR2, which could be interpreted as an antigen-selected mutational hotspot. The increment of mutations with antigen dose  possibly indicates that the maturation of the immune response is a continuous process with the production of an increasing number of hypermutated memory B cells with time. In the special case of RA, the local joint destruction may release antigens that lead to the hypermutation process. Characteristic for B-cell hypermutation are the elevated R/S ratios in the CDR. In the present study there was a direct association of the overall R/S ratios with the duration of local disease. Synovial B cells were shown to undergo a germinal center-like reaction in RA [5,16]. Therefore, we suggest that the activated B cells from this patient have undergone a local maturation in the germinal center-like structures detected in the peroneal tendons (left and right). On the other hand, the fact that one lesion was free from FDCs and exhibited only an acute inflammatory infiltrate could support the model proposed by Oprea and Perelson ; the already mutated germinal center B cells from the peroneal tendons might have migrated into the cubita synovial tissue, as has been shown for closely located finger joints , and re-entered in a cyclic hypermutation process. The apparent existence of a mutational pattern on amino acid level of clones obtained from the different regions could support this hypothesis. However, the existence of clonally related B-cells in the cubita and left peroneal tendon leaves no doubts that, in the patient studied, there is cyclic re-entry of the mutated B cells from the early RA lesions in the hypermutation process  that sequentially colonize new germinal centers, as proposed by Kepler and Perelson . These reactivated B cells then invade new anatomical regions, leading to the perpetuation of the chronic inflammation in RA. We dedicate this work to Prof Dr G König, Baumann Klinik, Stuttgart, Germany. We would like to thank C Berek, HJ Kim for the help with the IgVH genes analysis, K Born for helping to prepare the manuscript, and E Schmitt for expert technical assistance. This work received the approval of the local ethics committee, and we would like to thank the patient SP for her cooperation in our study. This work was supported by the Deutsche Forschungsgemeinschaft, grant KO 1837/1-2, to V Krenn and to A König. MM Souto-Carneiro was partially supported by JNICT grant PRAXIS XXI BD/15766/98.